Join me in a fun afternoon history and tapas tour in the Literary quarter of Madrid! In this authentic experience I will share some interesting facts about Spain's history that will help you to see Madrid not just as the Spanish capital, but as a city full of hideouts, stories and traditions and culture dating back centuries. We will tour one of the most beautiful neighborhoods in the city and I will point out most significant details. On this tour I will show you some of the best bars in Madrid where the local people of Madrid are meeting up during their daily routines. 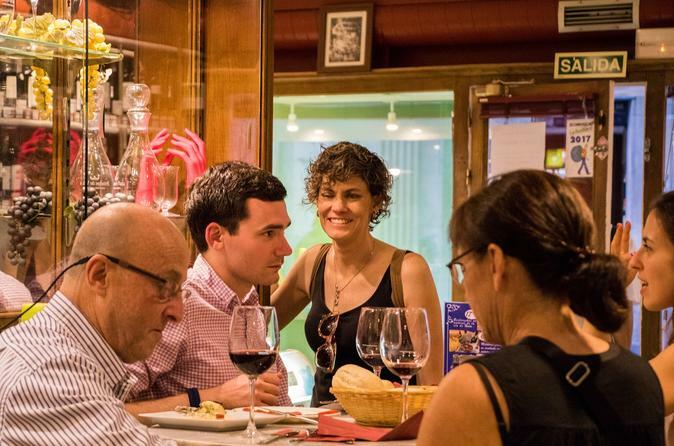 We will taste the typical tapas loved by the locals; I will teach you how to order and will tell you all about how to pair the most popular food in Spain with drinks. What a better way to learn about city's history and culture than by tasting it? I will take you on to a typical Spanish "tapas" - which means to go out, to meet with friends while tasting and sharing various dishes. The tapas tasting would not be the same without pairing the bites with delicious high quality local red and white wines, or maybe you prefer a beer? Come join me on this authentic Madrid experience and you will bring back the best memories from your trip.